GREENBELT, Md. — A federal jury began deliberating Tuesday in the trial of an investment adviser charged with orchestrating a multimillion-dollar Ponzi scheme to finance her lavish lifestyle, including spending more than $800,000 for prayers by Hindu priests in India. At the end of Dawn Bennett's trial on fraud charges, a prosecutor said the 56-year-old Maryland woman defrauded her investors in a desperate attempt to save her failing business, a website selling luxury sports apparel. 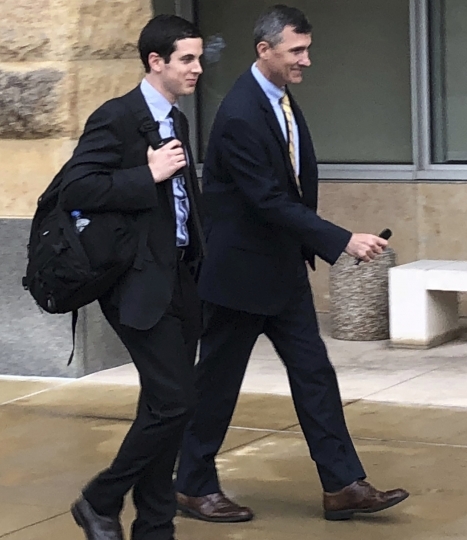 "It's a crime that cost people their retirement accounts, their life savings," Assistant U.S. Attorney Gregory Bernstein told jurors during his closing arguments. The 12-member jury deliberated for roughly two hours without reaching a verdict before breaking for the night. Jury deliberations are expected to resume on Wednesday morning. Bennett's attorney, Dennis Boyle, portrayed his client as the first and largest victim of a fraud scheme that the defense lawyer tried to blame on another official from her company. Boyle said Bennett invested more than $8 million of her own money in her company, DJBennett.com. And the defense attorney said Bennett relied on financial numbers and records prepared by the company's chief financial officer, Bradley Mascho, who was indicted on related charges. Mascho pleaded guilty in June to conspiring to commit securities fraud and awaits a sentencing hearing, but he didn't testify at Bennett's trial. Bennett also didn't testify. "In fact, all roads in this case lead to Mascho," Boyle said. In an affidavit, an FBI agent said a search of Bennett's home in Chevy Chase last year turned up evidence that she cast "hoodoo" spells to silence investigators from the U.S. Securities and Exchange Commission. Agents found instructions for placing people under a "Beef Tongue Shut Up Hoodoo Spell" and biographical information for at least three government attorneys working on the SEC investigation of Bennett, according to the affidavit. FBI agents also found the initials of SEC attorneys written on the lids of Mason jars stored in Bennett's freezers, suggesting she had cast spells in hopes of "paranormally silencing" the SEC attorneys, the agent wrote. However, jurors didn't hear any testimony about those spells during the trial, which lasted two weeks. But the jury did hear testimony last week that Bennett paid a website operator to arrange for priests in India to perform religious ceremonies to ward off federal investigators before her arrest last year in Santa Fe, New Mexico. For one of these "yagya" rituals, Bennett spent $7,250 for five priests to pray for her across 29 consecutive days. "I am in a very very tough fight going against my enemies and I need all the help I can get," Bennett wrote in an email to Puja.net website operator Benjamin Collins, a government witness at her trial. Boyle said the substance of the prayers and Bennett's religious beliefs are irrelevant and shouldn't be scrutinized by the government. "Prayer is an important part of Ms. Bennett's lifestyle," he said. "She is deeply religious." Assistant U.S. Attorney Thomas Windom questioned why Bennett wouldn't tell investors she planned to spend their money on paid prayers if she saw it as a legitimate expense. "Because it's patently frivolous. It's patently fraudulent," he added. Bennett raised more than $20 million from at least 46 investors in her luxury sportswear company, often preying on elderly clients who knew her from a radio show she hosted in the Washington, D.C., area, authorities have said. They said she used investors' money to pay off other investors and for her own personal benefit, including more than $141,000 on astrological gems, more than $100,000 on cosmetic medical procedures and a $500,000 annual lease for a luxury suite at the Dallas Cowboys' home stadium. The FBI's investigation of Bennett began in December 2015 after the SEC formally accused her of defrauding investors by inflating the amount of assets she managed and exaggerating the returns on her customers' investments. The SEC cited statements that Bennett made on her paid weekly radio show, "Financial Myth Busting With Dawn Bennett." Bennett's financial advisory business was losing clients and incurring millions of dollars in losses before she turned to the fraudulent sale of promissory notes to "tap a new income stream," the SEC said in its complaint.